Experience the Heart and Mystical Energy of Egypt with Rev Karen for 14 Days! Travel to the Motherland and experience the Heart of Egypt with Rev Karen. 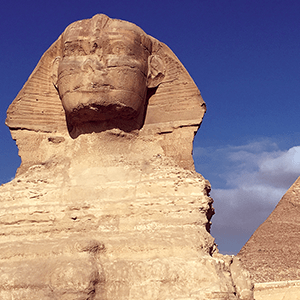 Feel the Presence and Power of Life Itself in the ancient Egyptian temples, Great Pyramids, Valley of the Kings, Nile Cruise, and the Red Sea. We will also travel with Rev Dr Kathianne Lewis and the Center for Spiritual Living Seattle’s community. Then call CSL Seattle Registrar at 206.527.8801 Ext 5101 or Registrar@SpiritualLiving.org to place your Deposit. By placing your deposit, this ensures you a spot on the trip! Each day, we will come together as a community and do spiritual practice together and dive deep into the mystical Presence found in Egypt. There will also be opportunities in which Rev Karen will lead us in yoga practice. Imagine having the priceless experience of soaking up some of the most sacred ancient places on the planet privately as a collective group – no other tourists/people around! We have that opportunity while visiting: the King’s Chambers of the Great Pyramid; Giza Plateau; Philae Temple at Dawn; and the Egyptian Museum. Arrive to Cairo Airport where you will be met by your Quest Travel representative who will assist you through customs before transferring you to your luxury accommodations at the Le Meriden Cairo airport hotel. Following breakfast, transfer to Cairo Airport to get on our short (one hour) flight to Luxor. Check into the deluxe Sonesta St. George Luxor hotel. In the evening, we will visit the Temple of Luxor and work with the brilliance of the human body called ‘The Temple of Man’. Here we are able to see that this temple is built like a human body. The outer layers represent the feet and as we move deeper into the temple, we move towards the head where the holy of holiest–the inner sanctuary–is located. This is a wonderful place to focus on physical healing. As you walk through the body of this temple, notice how your body feels and remember radiant health. Awaken the parts of you that are sleeping, activate divinity codes and turn on your inner light. 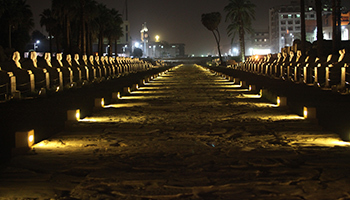 We will drive in the very early hours of the day to North Luxor city to visit Dendera. There we will visit the exquisite temple dedicated to Hathor, the Goddess of Abundance, Love and Joy. The temple is built with a zodiacal ceiling that recalls the origins of Egypt. On the rooftop where Hathor priests and priestesses gathered for their celebrations thousands of years ago, we reconnect to our destinies. Check in for Sonesta St. George Nile Cruise. In the afternoon, we will tour the Karnak temple, one of the largest temple complexes in the world. Karnak recalls us to the powerful acts of creation, of beginning anew, and of building on the divine plan. It has been home for more than 3,500 years to the living statue of the lioness goddess, Sekhmet, who will instigate our mystery school rites of passage. We will write and receive initiations inside the temple complex. In the early morning, we will visit the Necropolis of Thebes on the West Bank of the Nile. The West Bank holds the Valley of Kings–the tombs of the pharaohs that are inscribed with sacred transformative texts, including the books of knowing light and dark, the book of what is in the underworld, the book of caverns, and naming and taming the hours of the night. Here we’ll visit the tombs of Tutankhamun and the Royal tomb of Ramses VII and also visit the Valley of Queens with its unique tomb & many others. We will also visit the Colossi of Memnon. Noon sailing throughout to Edfu via Esna lock. In the early morning, we will visit the Temple of Horus at Edfu, one of the most beautifully preserved in Egypt. Here, we follow the pattern of the hero’s quest as we learn how Horus and his followers (the Shemsu Hor) conquered chaos, and we see the sacred marriage of the king and queen as the embodiment of Horus and the Goddess Hathor. The side chambers of the temple show the complexity of the rites that include a healing chamber, a perfumery, and singers’ rooms. One chamber, called the House of Life, stored all of the sacred texts used in seasonal and daily rituals. About mid-morning, we will sail to Kom Ombo , and visit the temple. 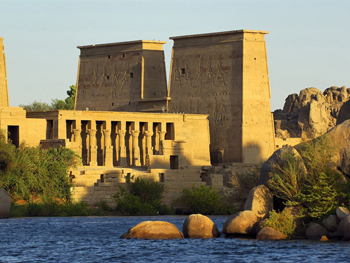 This dramatic temple poised between the edge of the river and the encroaching desert sand was dedicated to two gods – Sobek the Crocodile God of strength, fortitude, fertility and rebirth, and Horus the hawk-headed son of Isis and Osiris. 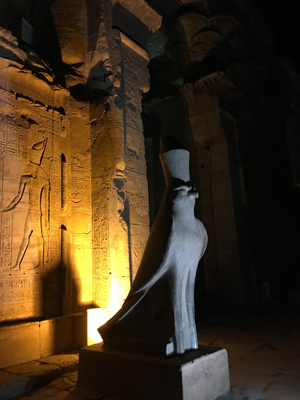 Early morning at dawn, we return to the source of all, the Great Mother, to receive the blessings of Isis at her beautiful island, privately at her temple at Philae. This isle represents a fusion of three great civilizations – Egyptian, Greek and Roman. The presence of Isis is palpable in the inner sanctum, the Holy of Holies of her temple. After exploring the grounds and some storytelling on the island, we return to the boat for breakfast and check out. We will enjoy a special afternoon of free time in Aswan, where you can explore the local market and/or check out the very fine Nubian Museum, which beautifully expresses the history and culture of the region. We will enjoy a special afternoon of free time in Aswan, a felucca sail around Elephantine Island, and explore the local market and/or check out the very fine Nubian Museum, which beautifully expresses the history and culture of the region. Tonight we enjoy the Nile Cruise final dinner. In the morning, we transfer to Aswan airport for our short flight to Cairo. Upon arrival, we then visit the incredible Mosque of Refaai, which was completed in 1912 and is built in the Mameluk style. Its exterior is sumptuously decorated with marble, cedar wood, and ivory ornamentation. The Mosque is in fact the family vault of Ismail and within it are buried Princess Khosiar, Ismail himself, his wives, Sultan Hussein Kame, King Fouad and Shah of Iran. Check in to Mena House hotel. In the very early morning, we start our very special day with a private visit to have a very powerful experience inside the King’s Chamber in the Great pyramid. Be open to the experience that changed many people’s life. Private visit to the Giza Plateau, when nobody else is there except our group. Listen closely as you awaken and dress for Sunrise at the Valley Temple of Chephren on the Giza Plateau. As you reluctantly come alive, you will hear the incredible sounds of the entire city being called to prayer. Open your door and listen – Feel the energy of the spirits. 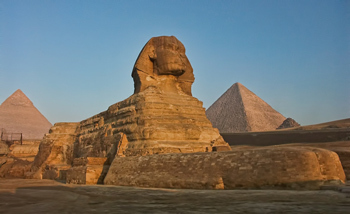 We will then be off to discover some of the most awesome Wonders of the World to touch them and to feel them — The Great Sphinx and the Pyramids of the Giza Plateau. We study them and pay particular attention to the Sphinx. Our guide, who is an encyclopedia of Egyptology, will give us detailed examinations of various controversial theories surrounding these amazing structures. Free time for shopping and in the afternoon we will visit Khan El Khallili Bazaar, one of the oldest shopping districts in the world. The Khan El Khalili, is like going back to the time of Ali Baba and Aladdin. Merchants have been trading on this site since at least the 14th century. In 1384, an emir named Al Khalili built a great Khan here. A three-story hostelry intended to accommodate traveling merchants and their wares. Buyers visited the khan for the goods brought in on the merchant caravans, and the selling and bartering spread to the streets around. In the evening, you are invited to the unique Sufi whirling (or Sufi spinning), a form of Sama or physically active meditation which originated among Sufis, and which is still practiced by the Sufi Dervishes of the Mevlevi order. It is a customary dance performed within the Sema, or worship ceremony, through which dervishes (also called semoazens) aim to reach the source of all perfection, or kemal. This is sought through abandoning one’s nafs, egos or personal desires by listening to the music, focusing on God, and spinning one’s body in repetitive circles, which has been seen as a symbolic imitation of planets in the Solar System orbiting the sun. As explained by Sufis. This morning is to relax and enjoy the hotel swimming pool. This afternoon we visit the famous Egyptian Museum. Our Egyptologist will guide us through this famous museum with a collection of over 200,000 ancient Egyptian artifacts, dating back to 4,000 BC. Visiting the museum is an opportunity to see the statues and artifacts that originally were located in the temples. This paints a fuller picture when you go the temples, like seeing the original furniture designed for a house in ancient Egypt. There you will also experience first-hand the different periods of ancient Egypt and the individual artistic and architectural styles of each period. 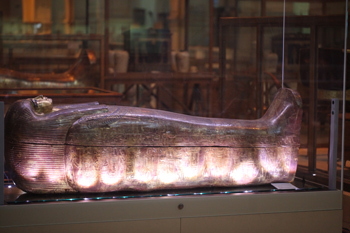 One of the many highlights of this museum is the visit to the treasures of Tut-Ankh-Amun. Stand before the breathtakingly beautiful gold death mask and marvel at the treasures that traveled with this boy king to the afterlife. There will be time to explore the museum on your own and to feel the sometimes eerie presence of energies from the past that still linger within the statues. 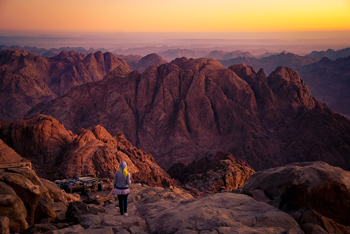 Early morning and after breakfast, we will drive through the Sinai desert passing by the Suez Canal and enjoy the colored mountains of Sinai before arriving to your “St.Catherine” hotel which is located across from the Monastery. Free time. Dinner & overnight at hotel. Very early morning, walk or take a camel ride at your choice up the Moses mountain where Moses talked with God and received the Ten commandments from God. Breakfast, then visit the Monastery of St. Catherine with its church which has been located there since the Six century. Free time & dinner at hotel. Following breakfast, we will drive for 2 hours to Sharm El Shiekh then arrive and check into your deluxe hotel located in a wonderful spot on the Red Sea with its sandy beaches and blue crystal water. Sharm El Shiekh was selected by United Nations to be the City of Peace. The rest of the day is at leisure for private activities or diving in a city situated on the southern tip of the Sinai Peninsula, in South Sinai Governorate, Egypt whose population is approximately 73,000 as of 2015. Sharm el-Sheikh is the administrative hub of Egypt’s South Sinai Governorate, which includes the smaller coastal towns of Dahab and Nuweiba as well as the mountainous interior, St. Catherine’s Monastery and Mount Sinai. It is now a holiday resort and significant centre for tourism in Egypt. Around midday, we will take you to a glass boat ride to see the underwater life. Or you may wish to enjoy a horseback ride into the desert of Sharm El Shiekh. Enjoy a morning in Sharm El Shiekh before we go to airport to fly to Cairo. Check in to Semeramis Intercontinental hotel located on The Nile in Cairo City Center. Early morning you’ll transfer to the Cairo International Airport for your journey home. Nonrefundable $500 deposit due to hold your space. Payment in full and payment plan available. All touring and transfers in air-conditioned motor coach. Entrance fees to all visits mentioned in the above itinerary. Domestic Air tickets from Cairo / Luxor + Asw / Cairo + Sharm / Cairo. Visa fees are currently $ 25 upon arrival for, USA, European Union citizens & UK. Quest Travel will assist everyone with the process. There is a nonrefundable $500 depositrequired to reserve your spot. Once you register, CSL Seattle will contact you for passport information (passport name, passport number, passport expiration date, nationality, and date of birth). 60% of total registration is due by February 15, 2017. Balance of total registration is due by July 15, 2017. If you cancel after Aug 15, 2017 you will forego the $500 deposit, plus be charged a cancellation fee of $500. If you cancel after Sep 15, 2017 you will forego the $500 deposit, plus be charged a cancellation fee of $1,000. If you cancel after Oct 10, 2017 you will be charged full price of land package / no refund. Anyone arriving or departing on same group arrival or departure day there is no charges, no matter how many flights are there. For anyone pre-arrival or post departure we charge $35 per person one-way airport / hotel and or vice versa.